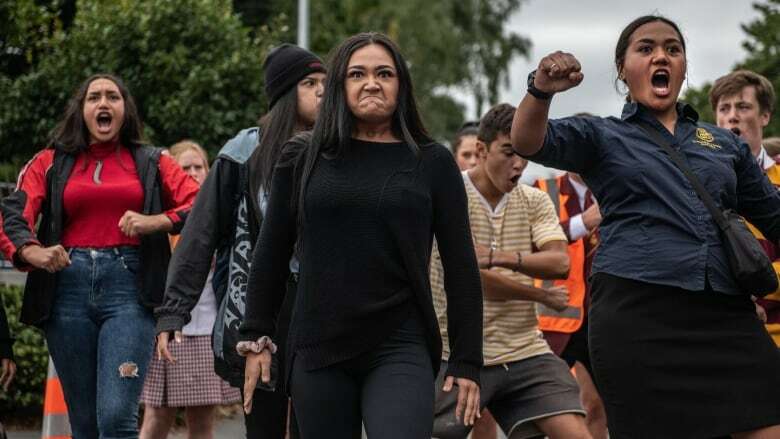 A video of young people performing haka in honour of the Christchurch shooting victims went viral on social media. Haka instructor Mihirangi explains the dance's origins and how it became a universal language shared by New Zealanders, Maori or not. By now, many people have seen the viral video of a group of young people performing a haka near one of the mosques attacked in Christchurch, New Zealand, last week. Their moving performance was in tribute to the 50 people who were killed when a suspected white supremacist gunman opened fire in the mosques. The haka is a traditional Maori performance with a long and rich history, and it has become a central part of New Zealand's cultural identity — Maori or not. In the viral video, Indigenous and non-Indigenous youth perform the haka with, what looks to be, equal mastery. Mihirangi, a Maori musician and haka teacher from the Ngāti Rākeiora tribe, told Day 6 about the origin of haka and how it became a universal language shared by New Zealanders. What is the meaning and origin of haka? In Maori tradition, to practice haka is to embody gods and ancestors, to feel empowered by their energy, Mihirangi said. "It's a personal challenge … to raise your vibration and pull on that energy in a very passionate and powerful way in unity with others and speak with one voice about the issue that is being spoken to," she said. "You can't help but stand up and listen. You can't help but feel moved by it." On what occasions do people perform haka? "If you look up haka online, it says that it's a war dance," Mihirangi said. "It can be a war dance. However, there are many versions of haka." You can write a haka for weddings, birthdays, deaths and even political gatherings, she added. When Mihirangi and her fellow musicians and performers toured Canada last year, they wrote a haka specifically for the families of missing and murdered Indigenous women. "We actually taught it to those communities as well," Mihirangi said. "It was a form and a way of offering empathy and standing in solidarity with those communities and with those families and just basically saying that we are there for them." How do non-Indigenous New Zealanders learn haka? There are many ways all New Zealanders would learn haka, Mihirangi said. The country's international rugby team, the All Blacks, perform a haka written about challenging themselves and others. "You can watch the All Blacks on the other side of the world and there would be a guarantee that someone in the local pub watching the All Blacks on television will be doing the haka along with them," she said. In New Zealand, children learn haka for school concerts or end-of-year events, Mihirangi said. Organizations also have haka taught to their employees for events. Do people understand the meaning of haka? When Mihirangi teaches haka to non-Indigenous people, she always starts by explaining the meaning and significance of the performance. "I recognize that ... cultural misappropriation is a big issue around the world," Mihirangi said. "The first thing I do is I go through the ceremonial process, which teaches them what it means — what it means to them, what it means to us and what the guidelines are to performing a particular haka," she said. "It's wonderful that everyone has a haka here … that they can perform and that they can call their own and that they can use in their lives." Have the Maori always shared their culture with others? The Maori make up 15 per cent of New Zealand's population, and Mihirangi says both their population and their cultural influence is growing. "There were periods of time where our doors were closed because of the fear of racism towards us and misappropriation of culture," Mihirangi said. However, she adds, "Our culture has gone through a renaissance and revival since the '80s, since our elders protested for our … cultural practices and our land rights." To hear more from Mihirangi, download our podcast or click 'Listen' at the top of this page.